How Incompetent Are Indian Security Analyst? The recent banning of sites due to Northeast India Exodus shows how incompetent Indian IT Security Analysts are. Its 2012 and India claims itself to be an IT powerhouse - yet they can't even do a simple task of filtering traffic. You can read an analysis by Prakash here. 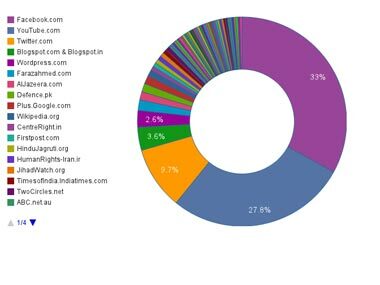 A pie chart of India’s blocked site.